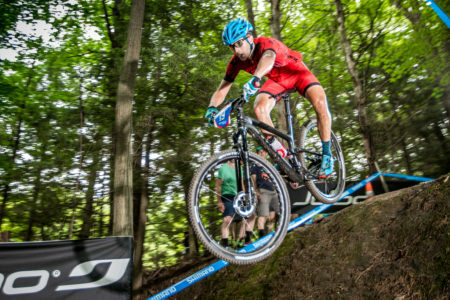 If you are new to the world of Professional Mountain Biking, the USA’s domestic professional series is the Pro XCT series. It is split into two halves. From March until June, the races are on the west coast with California rounds close together and the rest of them are peppered throughout the block. Followed by east coast rounds from July until the end of the series Previously the East coast would have one or two rounds if we were really lucky. 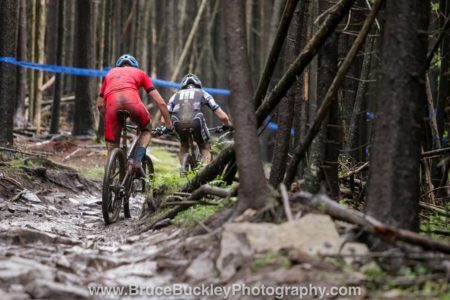 This year the east coast has been blessed with 5 back to back weekends of rowdy UCI racing. 3 Pro XCT’s, 1 National Championship, and 1 World Cup. As a college student, it is difficult for me to get out west. This is the story of how I took what I could and ran as far with it as possible. 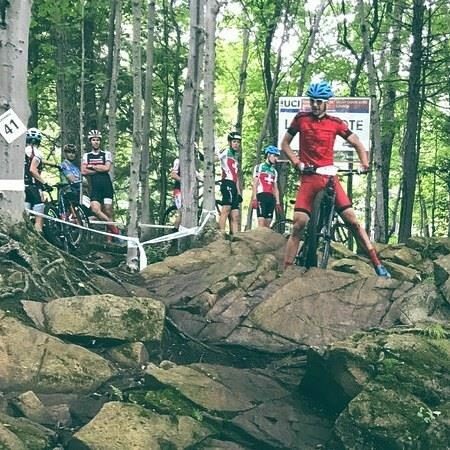 The 5 week block kicked off with the Eastern Grind US Cup in Williston, VT. 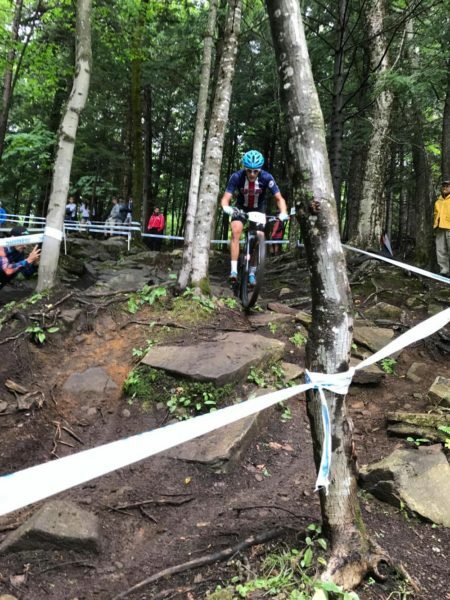 This was a really cool course because it featured a lot of really gnarly terrain that is not typically seen in American UCI racing. It was only a C3 which kept field size down but there was no shortage of talent. After having bad luck (maybe it was bad strategy) in every UCI race before this, I was comforted by the fact that I had a second row call up. I was then helped out by Todd Wells missing a pedal on the start causing a crash on the other side of the grid. I was able to get into the first single track in 7th. I pushed my way up to 4th. Unfortunately Eating 5 gels and drinking a lot of sports drink put a lot of sugar in my system and I started cramping really badly with 1 lap to go. Finished on the day in 5th. 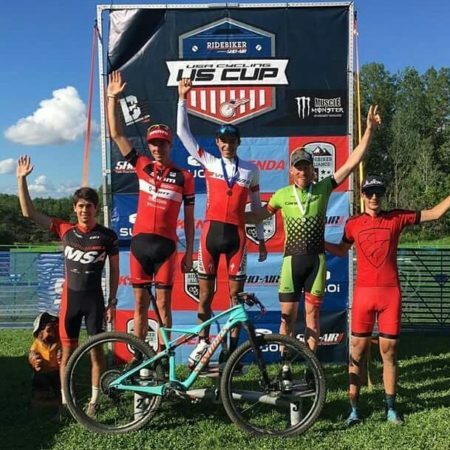 Sure it was only a C3 but a Pro XCT podium is still a podium and it showed me that my previous failures at bigger races wasn’t form related and instead they were preparation related. Changing up everything about my pre race routine from riding to nutrition made a world of difference. The following day in the STXC I got to start on the front row with my heroes in the sport which was one of the coolest experiences ever. 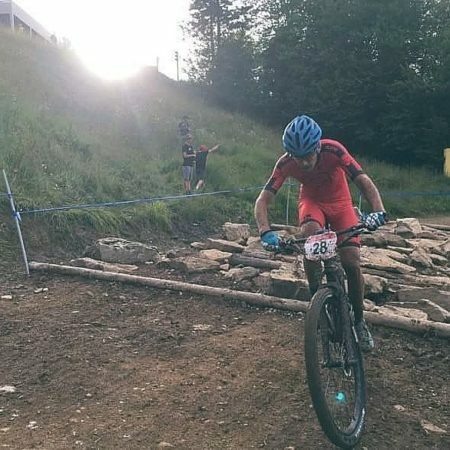 I was feeling good but at some point during the 20 minute race, I lost my concentration for a lap and found myself pretty far back from the leaders but I then saw that everyone was getting shelled off the lead group. If you race with your legs and not with your head like me, you realize that these are perfect conditions for an epic bridge. It breaks the gap into very manageable chunks. Because there is always a wheel not too far ahead. Before I knew it, I was in the lead group. Grotts was off the front but before I knew it we had 1 to go and the pace was bananas. I was so focused on getting a top 5 that I may or may not have blacked out. I remember coming into the last turn in sixth and picked up two spots in the final sprint to finish in 4th. This weekend was the spark that ignited a fire of confidence in me and probably meant the difference between burning out during this block and being fueled by positive energy. The second week brought us to Snowshoe, WV. There have been a mixed bag of reviews on the course and the event. I’ll be the first to say that it was an awesome venue for an event of this size and the course was pretty lame but because you could pass on 90% of it, the course made for great racing. I had a pretty good idea of what to expect because when I came here in October for Collegiate nationals I got to experience every possible condition over a span of 4 days. Dry and dusty, mud, snow, ice. Because I knew all of the good lines for different conditions, my pre ride time was spent just trying to keep the legs open and feeling fresh for all the climbing on race day opposed to sessioning poorly made rock gardens which would maybe return half a second that could easily be lost if you didn’t throttle the climbs. If you thought that July would be any different than October, you’d be wrong. There were many weather calls being made causing schedule changes. The practice times kept getting switched around, races were shortened, and probably the weirdest was when there was a tweet that all STXC races were cancelled, but then two hours later said races only had a 2 hour delay. Of course I start eating a bunch of food way too close to the race and start opening up youtube, but everyone I had to race with was in the same boat. The Short Track race brought back a very painful memory of the collegiate short track national championship. This definitely one of the hardest course with a lot of climbing and the descending is very high speed so there is limited recovery. I started 6th row and pushed my way up pretty far. I was riding on the absolute edge. If I made no mistakes, I could sustain it but if I bobbled even a little, I would not be able to recover from it. It was nationals I wanted to take every risk I could. The rider in front of me crashed in the rock garden sending me into what was not even a line. I lost quite a few spots. People attacking while I am trying to get back in my pedals. I did what I could to get people who were moving backwards but I did not get to where I was before. I ended up finished 15th, covered in mud, sweat and drool because I was so cooked, I could not control my face muscles. 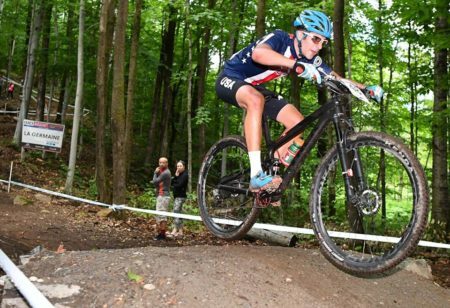 It was time to get geared up for the U23 XCO race on Sunday. That race would be 5 brutal laps on a course that was absolutely destroyed from the weather of the week. I started on the second row and did what I could but ended up going backwards. 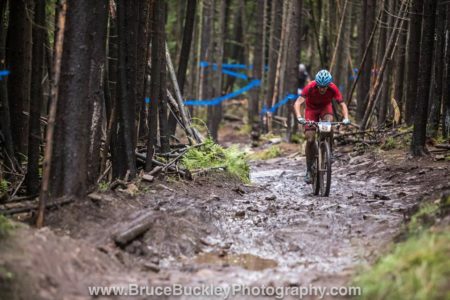 It only took the first muddy section in the Enchanted Forest for me to move up to 5th place. Then I started feeling good and I was up with the lead group. I stayed there for 2 laps when I listened to my body that I was on borrowed time. I decided to back off and ride my own race. I was joined by 1 fast palooka by the name of Sandy Floren. We had the ultimate battle. I attacked with 1 to go and almost made it up to Luke V who was in second. Unfortunately I am not sure that was sustainable and Sandy caught me again shortly after. I then crashed in that silly rock garden and he got away. In trying to catch him, I started to make more and more costly mistakes so I just tried to focus on holding onto 4th. I was very happy to come away with that. I learned even more about race prep this week and am very grateful that I had a rad teammate (Sammy Hedlund) to ride with all week and talk lines with. Week three brought us to the Boston Rebellion US Cup. This was one of the bigger races in the country. It was a UCI HC and the Boston crowd coming out to watch the racing. The course was pretty mellow. 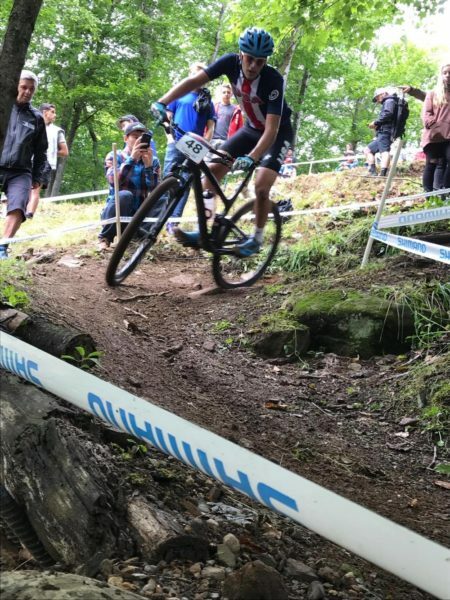 It was flat and there was a speed limit in the tight twisty woods but there were lots of UCI points on the line so the faster you go, the rowdier the course got. In this huge field I started second to last row and only went to the back in the first couple minutes. However, I was on the move. I got myself from around 50th place to 7th in 2.5 laps and was feeling incredible. Unfortunately I got a flat as far away from the tech pit as possible and lost a lot of spots. 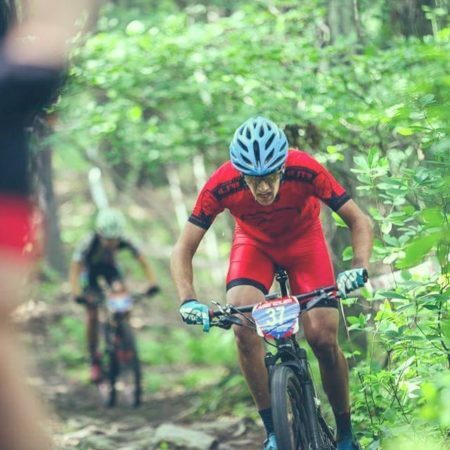 Once I got my spare wheelset, I was ripping lap times that were just as fast but was only able to come to a 36th place finish. Day two of Boston was short track day. This course was very fast and very wide. Last year it got strung out a lot more. This year there was a lot of wind so the racing was closer. I felt very much in control of what I was doing. I felt that I could move around in the pack and position myself for a good finish. On the last lap I positioned myself for the 5th place finish and flatted the front tire. Pretty tough odds there. I almost ended up in the stream trying to control the bike but I brought it in for 18th. 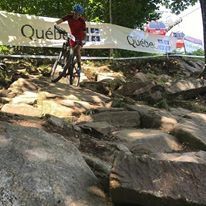 Week four brought me to my first World Cup in Mont Sainte Anne, QC CAN. This was arguably the coolest experience of my life so far. Walking around the pit was unreal. When the course opened up, I headed out for my first lap and I’d be lying if I said I was having fun. 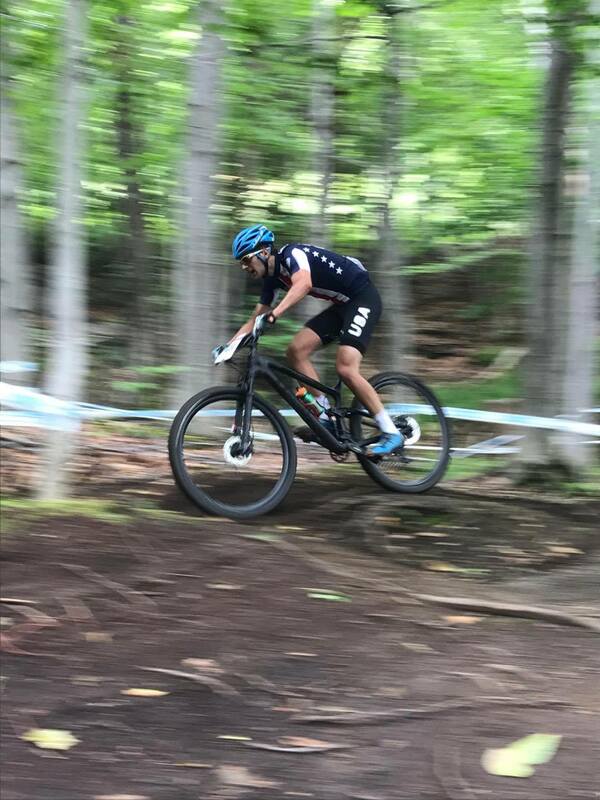 People always say that World Cups are jokes of courses and this track was so tough that after one lap, I wanted to go home because I was not having fun. This was when it was dry. Incredibly steep climbs followed by even steeper rock faces and rowdy descents. The following day, I rode it in the wet. This was as close to a nightmare as I have ever gotten in my life. I ended up having a pretty bad crash on Beatrice which knocked my confidence quite a bit. The worst part was the medics sat me down right near it to fix me up and I am sitting there watching the next ten riders do the exact same thing that I did which made me very scared of this infamous feature. The rest of the day was spent resting up for the race because I was beat up. Sunday was race day. I don’t think that I have ever been more nervous for a race in my life. It was cold and raining. The warm up was very silent and serious. I got into my call up corral and tried to do everything I could to keep nerves down. I line up and suspense building music starts to play as everyone starts moving up the grid to fill every little opening and with 15 seconds to the start the heart beat plays. I was just standing there at the line but my heart rate was near threshold level. Adrenaline is pumping through my body and then were off. The music quickly changes to exciting rock music and chaos would be an understatement to describe what this start was like. Every lap was a challenge. I eventually found my groove and did what I could to move up in the field. Fueled by cheers from all of my college friends coming up to watch the races and cheering me on. I got as far up as 31st when due to a cracked rim I burped and then punctured. I was in such a box that I didn’t think to use my Co2 until I had already lost a bunch of positions. I finished 38th. Despite the minor issue there, I still improved on my start position and finished lead lap of my first world cup. Learning about 2 years worth of knowledge in about 3 days. 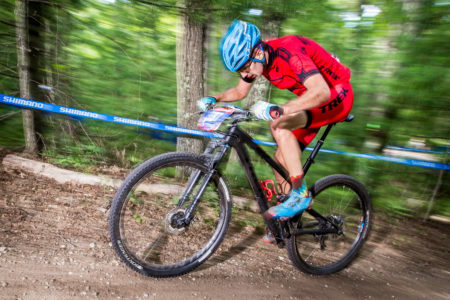 I cannot wait until my next opportunity to race another World Cup. The final week Holy Month was the Windham Pro XCT. Last year this race was where I had gotten my first ever UCI points last year. I remember riding this course and thinking that the climbs were so steep and the descents were frightening because they were as steep and rocky as they were. 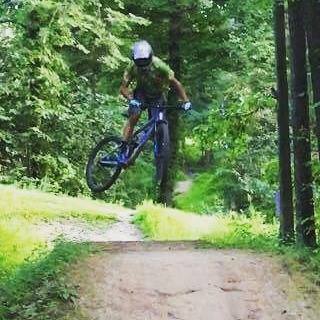 MSA made Windham look like a local race course. I was able to relax and recover anywhere on the course. 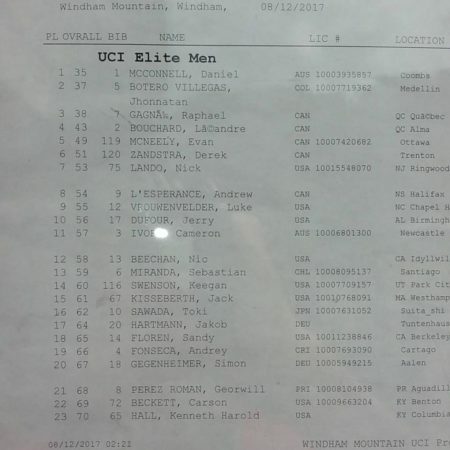 I made the last minute decision to race up into the elite category because at the end of the day the goal was to get UCI points and there were more than twice as many points in the elites. With 5 laps my goal was to rip the climbs and relax on the descents. It worked incredibly well. There were so many awesome cheers and heckles from my fellow New Jerseyans as well as my New England friends which I very much appreciated!! I managed to get from the last row up to 7th. Battling it out with Derek Zanstra for 6th until he outsmarted me at the top of the climb on the last lap. 7th on the day gave me 30 points which I would gladly take with me into next year. I started this year with a measly 6 points and nobody knowing who I was to having 41 points (after those 6 expire) and showing everyone I could that I am serious and want to take bike racing as far as I could. I met a lot of awesome people from out west and had one of the greatest months of bike racing ever. I have so many people to thank for making this season possible. From sponsors, to everyone who donated to my gofundme, to the incredible support of my family and friends. I’m wishing awesome karma to everyone that helped me out. I cannot wait to see what next year will bring. Peace out 2017!